Last week, while picking my kids up from their daycare at the end of a long day (and long week), I was trying to herd both of them out the door (while they tried to come up with any excuse to stay just a few more minutes to look at the books, look at the classroom pet turtle, look at the carpet…like I said, anything to stay!). As I carried the 18 month old, plus two “nap bags” of blankets, sheets, lovies, and art projects from the week, I opened the door for the 3 year old to step out onto the patio. However, I must not have opened the door wide enough because as she walked out she hit her forehead squarely into the doorknob and burst into tears. With two hands full and a toddler hysterically crying, I sat down on the front step, dropped the two overfilled nap bags and put down the baby to give her older sister a little TLC. 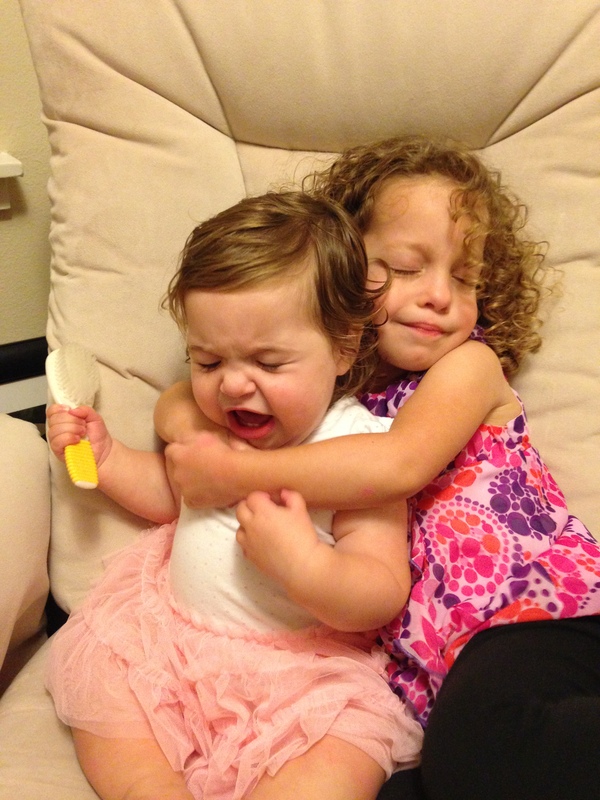 As I got down on their level, the baby saw the cup of crackers her sister was holding and reached for one, only to be met with resistance from her crying sibling. This sent the younger one into tears too. As I sat on the step of the now closed daycare, alone, exhausted and mildly aware of the milk, raw chicken and other groceries sitting in the trunk of the car, I looked into the two faces of my babies, who were looking back at me with mouths wide open, heads tipped back, tears streaming down their faces. In a moment of total helplessness, and with very real awareness of their dependence on me, I let out a little chuckle at the ridiculousness of the scene before giving them a dual hug and looking around for where the social scientist was hiding, waiting to analyze my every move. Perfection is a fallacy when it comes to parenting. Even with the best of intentions, perfection doesn’t exist. That’s what makes parenting so raw and so real. We all make mistakes – it’s what we do about those mistakes that matter. Before having kids, the standard to which I held myself was higher than was really attainable. But now, with dried graham cracker drool on my shoulder and the theme song to Bubble Guppies running on repeat through my mind, those standards have changed. It’s no longer about being perfect. It’s about being the best mom I can be, even when that means accepting (momentary) defeat and celebrating (miniscule) successes. Great words!! I have experienced this type of scene more times than can be counted. It’s about the trying to be the best not the most perfect. Love this!! Amen and hallelujah! Reading this situation and seeing that so many others have experienced the same thing–it’s so comforting. Those kinds of moments make me feel so defeated, like why am I even trying? Thank you for another beautifully written and oh so connecting entry!